Earlier in the year I promised to provide some biographical details about the men who are in the poems in Convoy. The only place to start is with my grandfather, Jim, taid as I called him (Welsh for grandfather). He was a merchant seaman all his life and first went to sea in 1919 at the age of sixteen, following in the footsteps of his older brothers Bob and Will. So this was why when Taid did mention the war it was about Malta and the suffering of the Maltese people. I can remember being well and truly told off as a child for not eating all the food on my plate and being told the Maltese had to survive by eating rats. I’m still not sure if that story is true but as an adult I can understand his annoyance at my not appreciating how lucky I was. I talked to my uncle, born after the war who remembers some more stories including one involving Taid and the captain of the Ajax arriving in Grand Harbour. Then a fellow poet, Peter Marshall, put me in touch with his father, John who sailed with the Ajax after the war. John sent a photograph of her arriving in Grand Harbour in February 1942 and in return I sent him a naval message from Operation Vigorous. Taid had helped himself to a paper copy of the message. I started reading Tom Neil’s book Onward to Malta to find out what it was like to be on the island during 1941. He left on Boxing Day 1941 on board the Sydney Star. Hadn’t something happened to the Sydney Star earlier? Didn’t Taid mention her as being a fine ship? So by this stage I’m was surrendering. The universe seems to have decided I am going to write about Malta as there was not just my grandfather’s story but also all the other men. And as I have discovered many of these stories have been forgotten. Not by the Maltese who still commemorate the arrival of the Operation Pedestal Convoy and whose government honoured the surviving seamen by issuing a medal in 1992. My grandfather was immensely pleased to receive his medal not long before he died. What would he have made of this book I wonder? I like to think he would have been proud and pleased. In lots of places I have had to imagine what it was like so I’m sure he would be able to find things I’ve not got quite right. I've never been to sea, never been under fire and never been to war. I expect like one of the RAF pilots he would tell me that what he did was nothing special. I disagree. 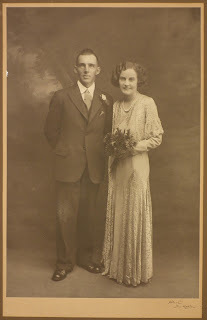 Today Jim would have been one hundred and ten years old and I leave you with a photograph of him and my Nain on their wedding day on 12th August 1932. They do make a good looking couple don't they Judi and now I think about it properly my nain was always well dressed. Engrossed is the word Mavis and not long to go now until Convoy is published. thanks for visiting and for the story about your Taid. Compost for poppies just about sums up the Battle of Somme. The Joy of Reading – Sometimes!